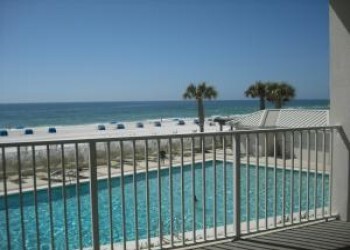 Fabulous Pelican Pointe complex in Orange Beach, AL. Three bedroom, two bath condo. Gulf Front. Large Balcony overlooks huge gulf front outdoor pool. Second Floor. Two elevators. King bedroom, queen bedroom, third bedroom has two double beds. Tile throughout, double crown molding, beautifully decorated in soothing sage greens and butter nut. TV & DVD player in all bedrooms. Fully equipped kitchen with all major and small appliances. New washer and dryer behind louver doors in kitchen area. Spectacular outdoor pool. Separate kiddie pool for the little ones. Our balcony over looks outdoor pool. Exceptional heated indoor pool, hot tub, exercise room, sauna. Lighted tennis courts. Basketball goal.